叶露, 陆华, 俞华明, 徐岚, 杨素娜. 上海汽车制造业涂装废气VOCs排放特征[J]. 环境监控与预警, 2019, 11(2): 17-21, 30. YE Lu, LU Hua, YU Hua-ming, XU Lan, YANG Su-na. 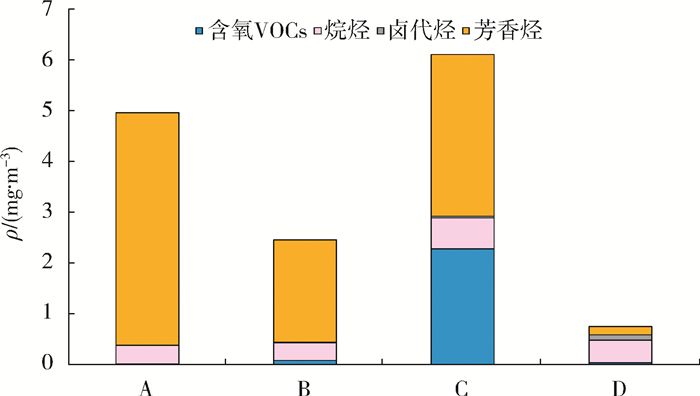 Emission Characteristics of Volatile Organic Compounds from Coating Exhaust Gas of Automobile Manufacture in Shanghai[J]. Environmental Monitoring and Forewarning, 2019, 11(2): 17-21, 30. 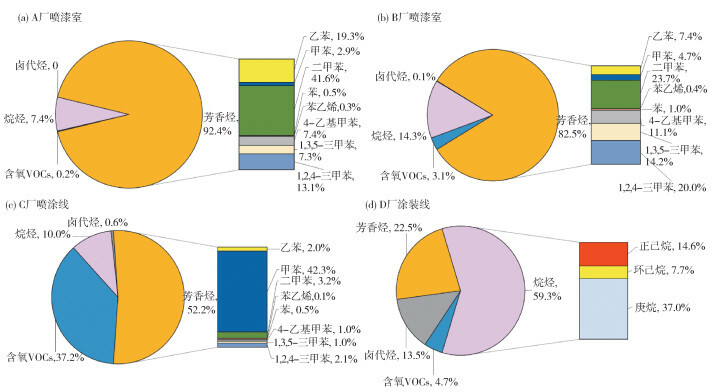 Abstract: A survey on the concentration and composition characteristics of VOCs from coating exhaust gas of 4 automobile manufacturers(A, B, C, D)in Jiading District of Shanghai in Oct 2015 had been carried out.In the painting workshops, concentrations of total VOCs were 0.743~6.11 mg/m3. Main compositions of VOCs for A were xylene, with the concentration of 2.06 mg/m3, for B were xylene, with the concentration of 0.578 mg/m3, for C were methylbenzene, with the concentration of 2.59 mg/m3, for D were heptane, with the concentration of 0.274 mg/m3.Aromatic hydrocarbons accounted for the highest proportion of VOCs from A, B, C, while alkanes were the dominant VOCs from D. According to the analysis of raw and auxiliary materials and production technology, it shows the types of raw materials affect the main component and the concentration of the emissions. 莫梓伟, 邵敏, 陆思华. 中国挥发性有机物(VOCs)排放源成分谱研究进展[J]. 环境科学学报, 2014, 34(9): 2179-2189. 张桂芹, 姜德超, 李曼, 等. 城市大气挥发性有机物排放源及来源解析[J]. 环境科学与技术, 2014, 37(S2): 195-200. EPA Method TO-15, Determination of volatile organic compounds (VOCs) in air collected in specially-prepared canisters and analyzed By Gas Chromatography/ Mass Spectrometry (GC/MS) [S].1999. WADDENR A, UNO I, WAKAMATSU S. Source discrimination of short-term hydrocarbon samples measured aloft[J]. Environmental Science & Technology, 1986(20): 473-483. SCHEFF P A, WADDEN R A, BATES B A, et al. Source fingerprints for receptor modeling of volatile organics[J]. JAPCA, 1989(39): 469-478. 环境监控与预警, 2019, 11(2): 17-21, 30. Environmental Monitoring and Forewarning, 2019, 11(2): 17-21, 30.